Spring is fast approaching and tulips have started to pop up out of the garden. 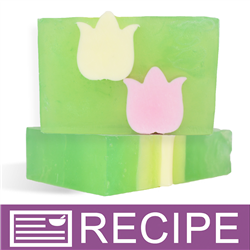 Make this fun and flowery springtime soap with embeded tulips fragranced with a fresh and bright floral fragrance that reminds you of a fresh bouquet of tulips. Ensure both Tulip column molds are securely closed. Add a large binder clip to each side if you are concerned with the mold coming apart. Place on jelly roll pan to catch any spills. To one Mix & Pour Funnel Pitcher, add 6.6 oz. white soap. Melt in microwave. To melted white soap, add (2) 0.15 ml scoops of Plumberry Pink Mica and mix well. To second Mix & Pour Funnel Pitcher, add 6.6 oz. white soap. Melt in microwave. To melted white soap, add (2) 0.15 ml scoops of NuTone Yellow Mica and mix well. Cool the soap in both Mix & Pour Funnel Pitchers to 125°F. Fill one tulip column mold with pink soap. Let soap cool. To a large 32 oz. measuring cup, add 30.8 oz. clear soap to bowl. Melt in microwave. To melted clear soap, add (4) 0.15 ml scoops Sliced Green Kiwi Mica and mix well. Add 1 oz. Blooming Tulips Fragrance Oil to soap and mix well. Remove cooled Tulip Soaps from column molds. Trim sides of any excess soap. 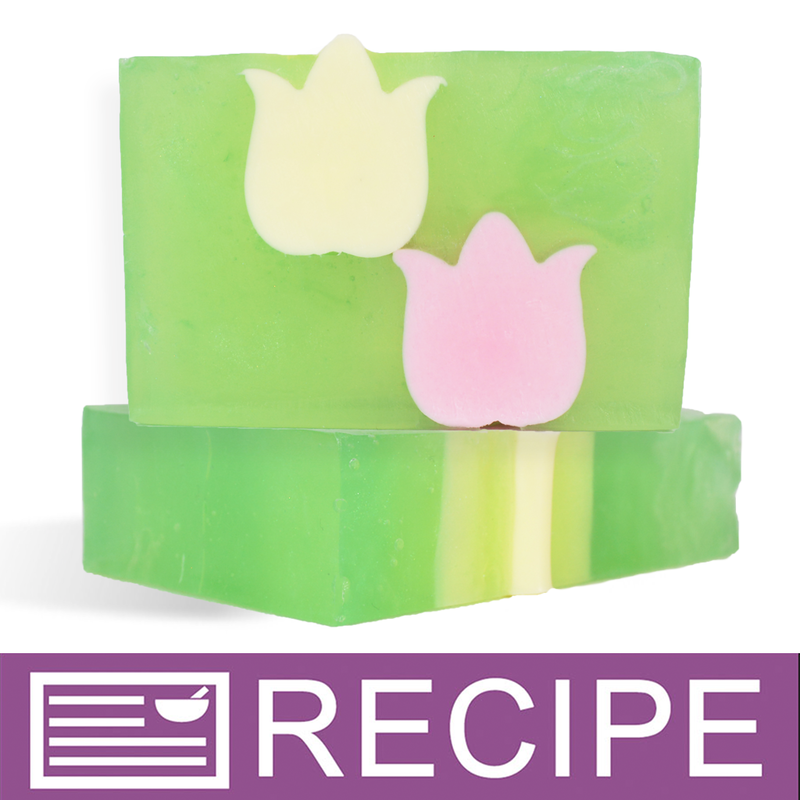 Cool green soap to 125° F.
Place the pink tulip soap into the Regular Loaf Mold. Spray liberally with rubbing alcohol. 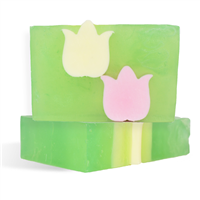 Carefully pour green soap along both sides of the pink tulip soap until the top is just covered. Set remaining soap aside and let harden. Spray soap with rubbing alcohol. Carefully place yellow tulip soap to one side of the pink tulip soap. Spray the tulip soap liberally with rubbing alcohol and then carefully pour the remaining green soap along both sides of the yellow soap. Spray the top of the finished soap with rubbing alcohol. Let cool. Once soap has hardened, remove from mold and slice into 8 bars. Wrap in airtight packaging. Ingredient Label: Sorbitol, Propylene Glycol, Sodium Laureth Sulfate, Stearic Acid, Lauric Acid, Water, Sodium Hydroxide, Myristic Acid, Sodium Cocoyl Isethionate, Glycerin, Titanium Dioxide, Fragrance, Mica, Iron Oxide, Manganese Violet, Fluorphlogopite, Tin Dioxide, Chromium Oxide Green. "Hi. I made this recipe a few days ago. Unfortunately, my layers show. The top layer around the yellow tulip is a lighter green than the bottom layer around the pink tulip. I followed the directions to the letter and paid close attention to the temperature. Any idea what would have caused this so I can not do it next time? ;-) Thanks!" Staff Answer The green mica powder and fragrance may not have been blended in completely. Before pouring the bottom layer, mix the soap well. If soap needs to be melted slightly to pour top layer, be sure it does not get too hot. This might affect the color and make the layers look slightly different.